Oh man, when you’re busy with “real life” stuff, time flies. A month has gone by and I’ve barely worked on the game. Incidentally, I am at the hardest part of the project as well, so that doesn’t help. I’m doing tedious slow features that require lots of patience and discipline, and those are hard to come by for me. And there’s no way I’m catching up now, which feels bad (and makes my progress chart horrible). Anyway. My game is basically a twin-stick shooter. Keyboard + mouse is all fine, but I also need controller support as lots of people play with controllers, especially this action-y shoot-y genre. So my test controller is an XInput Xbox 360 one, which is a common layout/setup. Hopefully, Rewired plugin can handle any variations between controllers, as I would really hate to need to stock up on various controllers for testing. Almost everything is straight-forward — I just need to assign buttons to actions and make sure the game uses input “actions” instead of directly checking buttons and such. I’ve already done most of this. The hard bit is the aiming, because that is technically completely different with the controller. The end result is very similar, but the underlying principles differ in many key features. Now I can proceed to rewire and retweak everything aiming-related to work for the controller — if the right analog stick is held down, the player “points” their aim reticle in that direction by a certain amount. In other words, right stick determines the angle for aiming. This means 3 systems have to use the aim direction according to current input mode — (1) input system itself, (2) camera controller and (3) reticle controller. 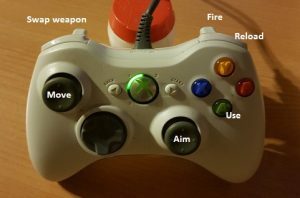 (1) Input system needs to provide independent mouse and aim values. All the direct mouse-based controls still need the exact mouse values and I cannot replace them with anything “modular” or shared. So a bunch of math here. I also need to use the raw aim offset, instead of camera’s smoothed offset, as that is too slow. The actual distance is just whatever feels good to play with and isn’t strictly speaking exact. I also need to smooth the reticle transition, otherwise it can jump too much due to controller input value abrupt changes (and deadzone issues). And (as seen in about GIF) this works out fairly well. Now, I don’t play games with the controller and I’ve really not played any twin-stick shooters — I just prefer the precision of mouse. So it’s hard for me to tell if my results are just “good enough” or any better. The player is still aware where the reticle is, it’s just not getting in the way. It’s also a reminder that the playing isn’t actually aiming at anything in particular. I want the reload animation to remain visible, because it’s the only UI feedback for reloading. And that about wraps it for aiming with the controller — a fairly convoluted and intense feature. I’ve never really dealt with this stuff before. But now I have two working modes for controlling and aiming the character. I will need to make a way to select the right one at the start of game and then hot-swap between them. Technically, all the controls work at the same time, only the aiming needs a mutually exclusive selection.